A delightful S-Shaped Oriental Sweet Plum (Sageretia theezans) artistic bonsai potted into an ivory/cream ceramic pot - Fruiting variety of bonsai for beginners. A contemporary & elegant bonsai with simple clean lines & provided with matching drip tray. Bonsai fertiliser and small pruning scissors are also included in this starter set. Would make a lovely starter gift set. Quick growing and highly recommended. This bonsai symbolises protection, creativity, new life & warm wishes. Lovely red tones on the new foliage and as the bonsai matures it produces small purple fruits. Care instructions will be provided and delivery is free to most areas. An elegant indoor bonsai with beautiful canopy displaying tones of red/tan on the new foliage. The foliage contrasts beautiful with the cream pot and matching ceramic drip tray. • FREE delivery to most of the UK. 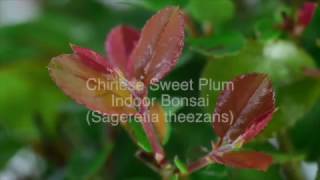 The Chinese Sweet Plum (Sageretia theezans) is a pretty indoor bonsai which has great character at an early age due to the flaky bark revealing tones of red/tan. The stunning foliage has hints of rusty red turning to glossy green. Small white flowers give rise to tiny plum-shaped fruits. A really pretty bonsai and great for beginners.